Most of the drawing is done. 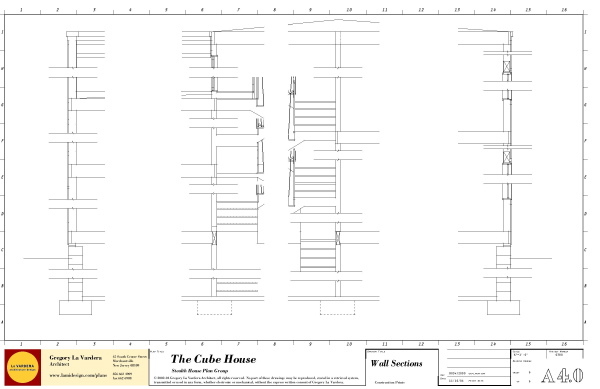 The Section sheet of the 0380 Cube House was completed yesterday, but for reference marks which will come from the Wall Section sheet when it is done. So all that is left to draw is the Wall Sections. I felt like I had slipped behind schedule with this but now I'm pretty confident it will be done by the end of December as I had hoped. This remains a big goal for us as this will be the sixth complete set of plans. I still think it is a meager selection for somebody looking for a house, but it is at least half way to a decent selection, and I'm pretty happy about that. 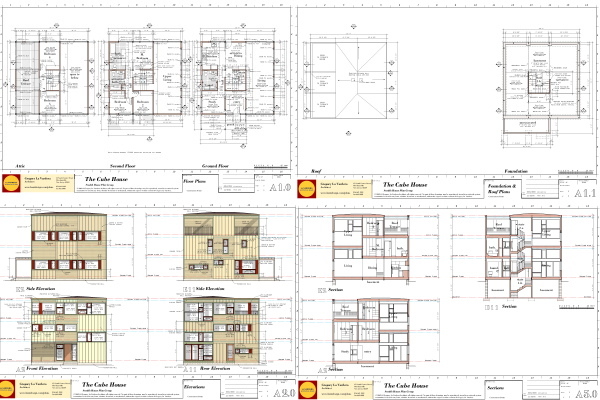 Here are the finished sheets so far - the floor plans, the foundation and roof plans, the elevations, the building sections. 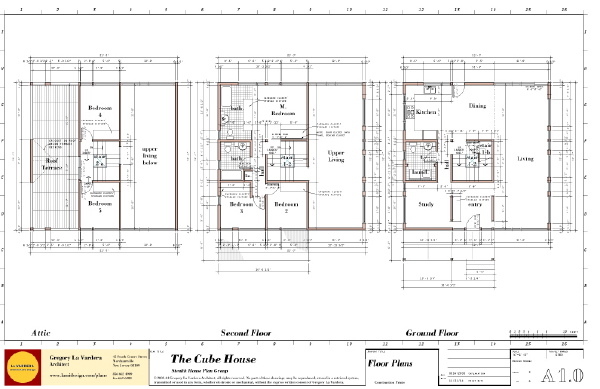 Continue reading "Cube House progress III"
Atomic Ranch Magazine covers our house plans. Atomic Ranch Magazine ran a piece on our modern stock plans in the Cool Stuff section of the Winter 2004 issue, pg 14. They tend to highlight products of their advertisers here, which we are (pg 49), but we are always grateful for some coverage that helps us reach more people. The piece features an image of the 0242 Plat House exterior and a smaller inset of the interior. They had interviewed me about the plans and I am very happy that they really captured the intent and positioning of the house plans as a product. Now if I could only adjust the color of my graphics for print I would be set. When going from RGB images to CMYK the saturation of all the colors seems to get so high the images end up looking like some technicolor kodachrome throw-back. Maybe thats ok for Atomic Ranch? Continue reading "0242 Plat House in Atomic Ranch Mag"
A design for a hill side site by a good friend. This is a house built by a good friend Peter Wong, in Charotte, North Carolina. Peter and I worked together in the office of an architect by the name of George Yu in Philadelphia. Peter left there to teach and settle in Charlotte, and I continued on practicing in Philadelphia. Peter eventually built a house for himself, and now his family, on a difficult site that slopes down away from the street. 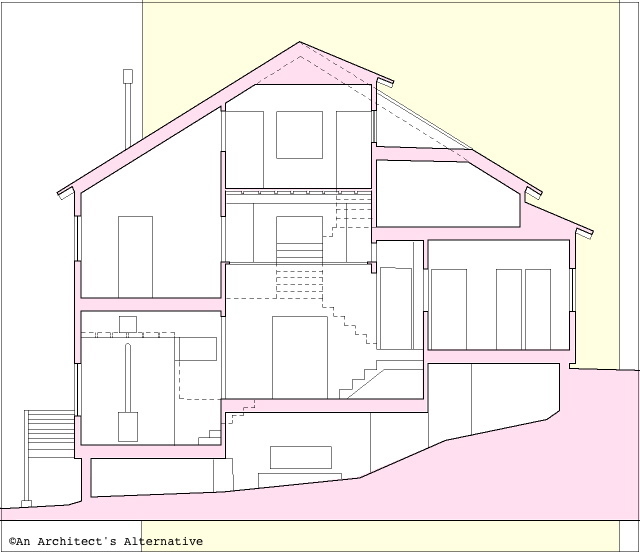 The house follows the slope of the site down with a series of interconnected rooms. Essentially it is a 3 bedroom, 2 bath house. The spaces are arranged such that they can serve several functions. The design supports use of a living room/dining room arrangement, or a living room/family room arrangement for more casual living. You enter the house off the street at the level of the first bedroom (which can also be a study, or guest room). From this level you descend to the dining space and kitchen level, and then to the living room level at the rear of the house. If you ascend from the entry you first come to the master bedroom level and its bathroom, and a stair continues up from there to a third bedroom. Along the way up is a library or study room that comes off of the landing of the stair. This last bedroom also has a small private alcove which again offers many possibilities for use. Unfortunately I don't think this upper level is shown on the plans. Most of these spaces are interconnected by openings that allow you to look from one to the other. 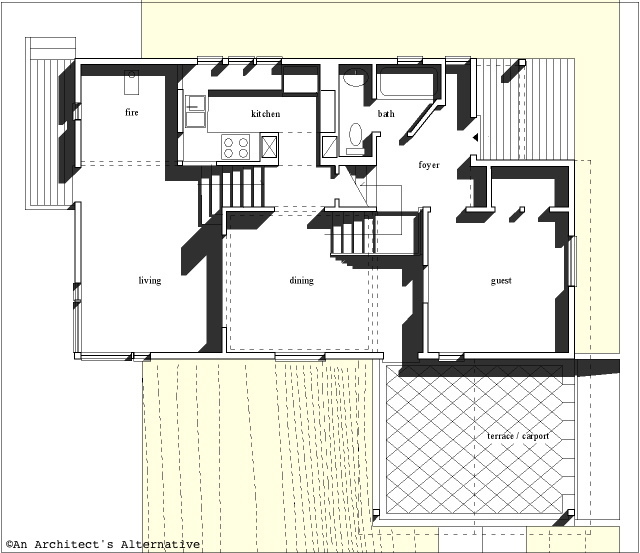 plan of the lower levels Peter has made a great study of Austrian architect Adloph Loos, and the design of this house reflects the multi-levels and intricately interwoven spaces that typify Loos' work. I find that I can look at this plan time and time again and be fascinated by imagining the spaces and moving through them. The section drawing below is a great aid in understanding the plan. Peter built this house, could be 10 years ago, I don't remember exactly. He needed to be very efficient to meet his budget, and at the same time satisfy his creative drive. Essentially he was dealing with the same issues that we have at hand in trying to make modern more affordable. The overall treatment is contextual, but the use of cladding thoughtful, and the massing of the house unusual. The arrangement of the interior spaces is where the house is most fascinating. plan of the middle levels Why am I showing this? Because I love the house and want to share it here. Also because I am trying to convince Peter to offer the house as a stock plan through my site. As you know I have created all the designs on my site, and I have been reluctant to offer anybody else's designs as I would want the quality to be on a par with my own, and I am very critical in this regard. Peter's work is intellectually rigorous as well as grounded in construction. I would be thrilled to see his work on available as it would give him a lab for his ideas and allow us to see them executed on a wider basis. section drawing of the house What can you do? Let me know what you think. If you don't understand the plans of the house, then ask me questions and I'll try to clarify. I will try to get photos from him of the exterior of the house as well, because after all this is already built. 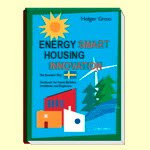 Continue reading "A very interesting hillside house design"
The plan sheet is near complete. A quick update on the floor plan progress. Dimensions are down and notations almost done. Nothing sweeter than a plan full of dimensions! If you are reading this blog entry so many years later, or arrived here after a search for "Cube House Plans", I just wanted to let you know this great house design was completed and is available for purchase in our catalog: 0380 Cube House. Thanks for taking a look. 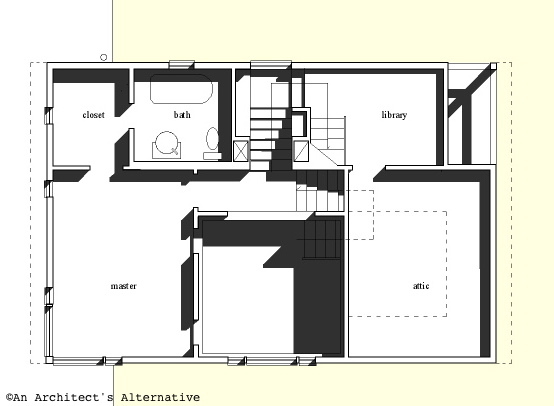 Continue reading "Cube House floor plans"
The last sheet is blocked out. Tonight I finished blocking out the wall section sheet. I will return to noting and dimensioning the other drawings before I flesh this drawing out - it will be the last to be finished. I have also done the building section sheet since I last posted but I seem to have skipped posting an image of that, no matter. So, a bit more than half way done I'll say. 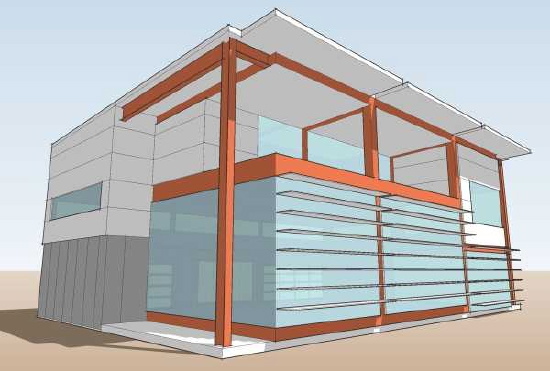 Continue reading "Cube House wall sections"
A new web page showing schematic views of the prefabricated steel house. I created a page with the images of the 6040 House because Fabprefab asked if we would like to see it listed in the FabZone on their site. I wrote a description and pulled together all the images so there could be something to link to from a FabZone listing. The floor plans of the prototype are presented here for the first time, note that I was not involved in the planning of the house and worked on the facades as described on the page. Also presented for the first time are images and floor plans of a study scheme prepared to utilize the same structural frame as the prototype. Freed of the prototype's floor plan we were able to explore more of the potential of this approach. Continue reading "6040 House gets a web page"
The elevations for the Construction Prints are drawn. I have been slowly making progress on all the basic sheets, the plans, elevations, and sections. The plans are more or less done and awaiting notations and dimensions. I have just finished bringing up the elevations to the same point - see the image below. The sections are next. The elevations for the first time in our Construction Prints will be in full color with a toned backdrop created from the 3dmodel of the house. 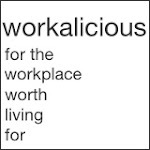 I am enthusiastic about this as color really has a lot of power to clarify and convey information. This new technique is a real win/win as it is a time saver and results in better drawings. Continue reading "Cube House elevations"